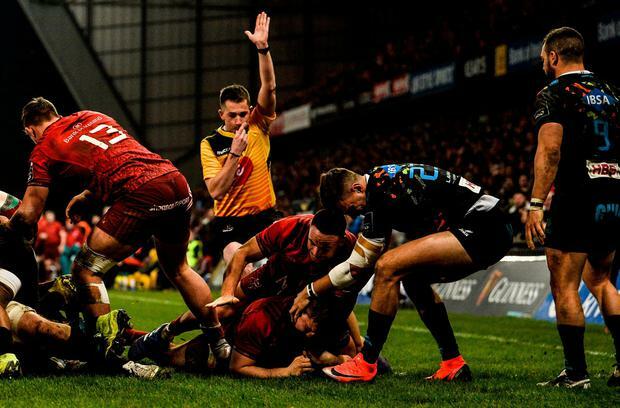 The scoreline flattered Munster in the end but coach Johann van Graan knows this wasn’t a bad test as they prepare for their Champions Cup quarter-final showdown with Edinburgh next Saturday. In the end it took some arrivals from a heavyweight bench to see off the spirited challenge of Michael Bradley’s men but Van Graan made it clear afterwards that he knows his starting 15 and it’s up to all the others to try play their way into that side. 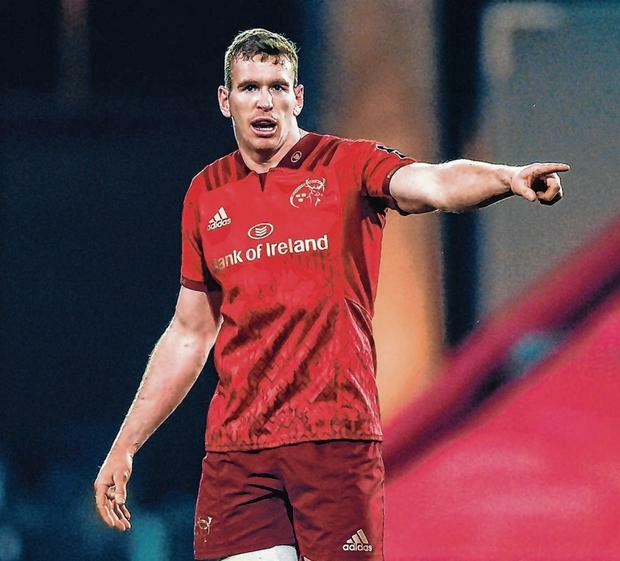 Tyler Bleyendaal’s display after coming on suggests he will be the starting No 10 in the absence of Joey Carbery, while the value of Chris Farrell was also apparent after he came into the midfield in the second half of a contest where Munster struggled for cohesiveness. 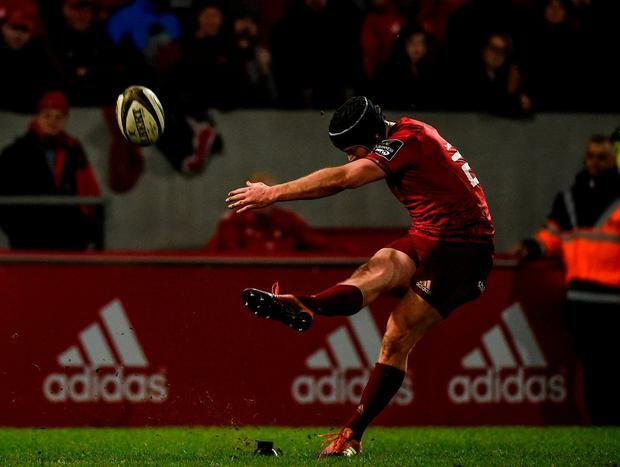 The return of versatile back-rower Jack O’Donoghue, making his first start of the campaign after recovering from a serious knee injury picked up in the PRO14 semi-final loss to Leinster at the end of last season, gives Van Graan further options. “He pushed so hard to get back. He said, ‘Coach, will you give me an opportunity’. I said I will. He made two appearances from the bench and one as a start. The players know that I am not a guy that makes rash selection decisions. “It’s good to have decisions to make and that’s all I can ask from the players – to keep me and coaching staff under pressure to make these decisions. “Now it’s about looking at his performance and the performance of other players. “Tommy O’Donnell is out, Chris Cloete is available, Tadhg Beirne could play on the flanks, CJ Stander could play on the openside, Arno Botha could play at No 8, Peter O’Mahony played there for Ireland against Australia back in the summer. “Jack is definitely one of those guys with a few different things we can do. We have got some specific plans for opposition coming up, but very happy with that performance from Jack. He was very close to being man of the match. Munster’s lineout drives got them back into contention after Zebre had punished their sloppiness at the back to open up a 12-0 lead. Former Northampton winger James Elliott got over in the left corner after ten minutes, while Mike Haley gifted Zebre their second try after 19 minutes when he spilled a grubber by Carlo Canna and tighthead prop Roberto Tenga took full advantage to score from close range. Canna missed a couple of penalties and Munster cut the interval gap to 12-5 when Jeremy Loughman powered over after a lineout drive. 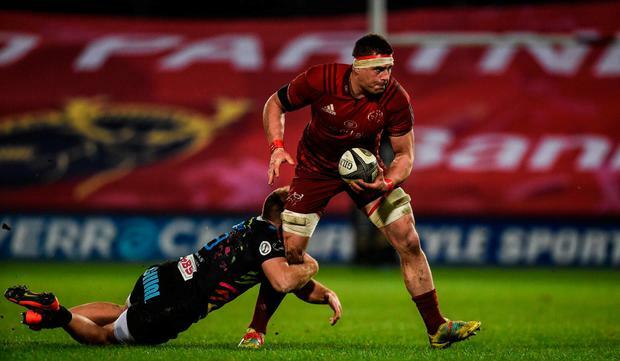 Munster’s heavyweight bench made a difference after the restart with Bleyendaal, Farrell and Jean Kleyn particularly prominent as they went on to wear down the Zebre challenge to win the second-half 26-0. But it took them time to stamp their authority but scores off lineout for Rhys Marshall and Niall Scannell did the business either side of a good one out wide from Darren Sweetnam, with the loss of Chris Cloete to a yellow card making little impact. They finished in style for a flattering win when Haley got their fifth try in the closing stages and now they turn their attentions to Edinburgh.